The target was to make an Android application to be able to record 3D video with the cellphone and virtual reality box.The request was also to be able to watch all videos (includin 2D made) in 3D in the virtual reality box. 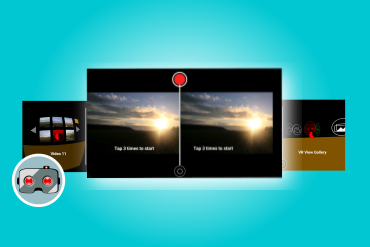 VR Video Recorder offers you to make videos under VR mode, save and watch them on the virtual reality devices. You can also open 2D videos from your cellphone gallery, watch them under VR mode (application translate them to 3D automatically) and adjust deepness of 3D effect. 1) Make Video under VR mode. 2) Control by gamepad or bluetooth controller. 3) Adjust 3D effect by buttons. 4) Easily access your gallery. 5) Watch 2D Videos in 3D.